I took my toddler, M to her first movie in the theater recently. I myself was stepping into a theater after 2.5 years, so we were bursting with excitement. The big screen does have a magical effect! I vaguely remember my first movie – it was a Hindi movie with Sunny Deol and Amrita Singh. All I can recall is the hero teaching the heroine to ride a horse.That’s about it. But I remember my dad bringing us samosas and ice-cream during the break and I remember being very happy. What’s your earliest movie memory? Comment! M’s very first big screen movie was ‘The Good Dinosaur‘. And I remembered to put the ticket stubs in her memory box! 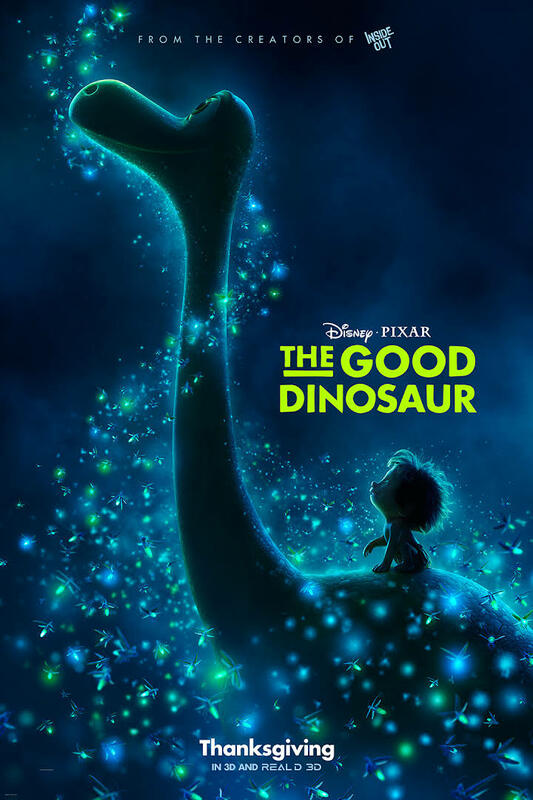 The Good Dinosaur starts with the infamous meteor missing the Earth 65 million years ago. So dinosaurs are alive and kicking, and farming and cattle ranching, anything but extinct. Arlo (the protagonist) is the youngest of three dino babies born to loving and wise parents. But Arlo is constantly overshadowed by his older siblings who always manage to finish their chores before Arlo finishes his. So they earn their mark on the family grain silo. Arlo wants to make his mark too but his irrational fears hold him back. Arlo is scared of chickens, fireflies, critters, just about everything. His parents deal with his fears with utmost patience. But one day, his father’s dam of patience breaks and he takes Arlo out in a rainstorm to teach him a lesson. The rainstorm is too strong. Sadly, Arlo’s father doesn’t survive the flash flood and Arlo is swept down river. He wakes up to find himself in strange territory, miles away from home, hungry, bruised, and of course scared. He knows he has lost his father forever and he has to somehow find his way back home. He makes an unlikely friend, a fearless little Neanderthal boy (or is it a girl?),Spot. The story follows the adventures of Arlo and Spot and their long journey home. This is a quintessential coming of age story, told in an extremely beautiful way. This is the kind of movie that will strike a chord with everyone, the young and the young at heart. It is however, a little serious for toddlers, who enjoy slapstick humor. Sadness dominates the first half of the movie. The scene in which Spot, who cannot speak, tries to tell Arlo that his parents are dead is gut-wrenching. M was inconsolable when she saw the flood wash Arlo’s dad away. In her little world, parents getting hurt is completely unfathomable. Or do kids do understand death at some level? Thankfully, Arlo is guided by his father’s spirit later in the movie. M thought Arlo’s dad came back to him and all was well with our world. This movie is made for the big screen. The animation is unbelievably stunning, every scene is a visual treat, something we’ve come to expect from Pixar. There are fields of fireflies, gorgeous sunsets, beautiful snow capped mountains and mighty T-rexes who aren’t as scary as they look and go on to become Arlo’s guardian angels. Spot is just the cutest little thing you’ll see after Agnes from ‘Despicable Me’. I just wanted to take him home and love him forever. Pixar, stop making me fall in love with animated characters! What I learnt from The Good Dinosaur – To face your fears head-on when life throws a curve ball at you. What M learnt from The Good Dinosaur – Dinosaurs stomp. Stomping is more fun than plain old walking. So that’s how we get around these days. » Esio Trot – Not just a Dahl-iance! I liked your mention of 'What I learnt' part in the post. Thank you, Saket! Is there anything that brings more happiness than samosas and ice-cream? 🙂 How's your Harry Potter adventure going?